Developer : Dating DNA, Inc.
* The app now supports the iPhone X. 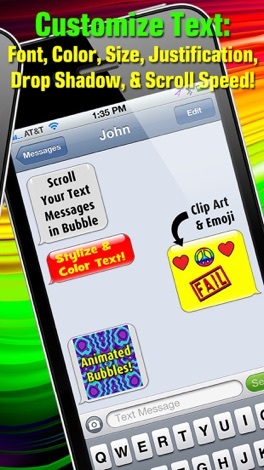 This is the Family Friendly version of the popular CLIPish app. Ideal for younger children, this version: 1) Keeps the Rating Filter set to the strictest level, 2) Removes the Web Search tab, and 3) Removes the Recents tab. • BROWSE THOUSANDS of Animations, Clip Art, Emoticons, Wallpapers, Photos and Videos. 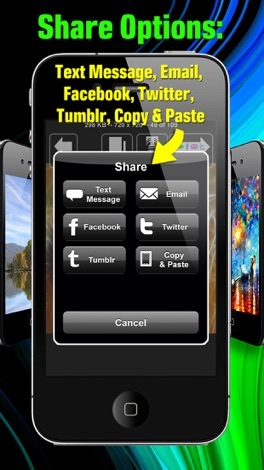 • SEND using Facebook, Twitter, MMS Text Messaging, Email, and more. • KEYWORDS SEARCH for specific items, such as "Easter Bunny," "Good morning," "I love you," etc. • PERSONALIZE images by adding text to any image or animation. Adjust font, color, size, and placement. • ONE-TAP SEND button for quick sharing within CLIPish, or SAVE your favorite items for quick insertion later via your Photo Library. • UPDATE your Facebook or Twitter status with or without an attached image. 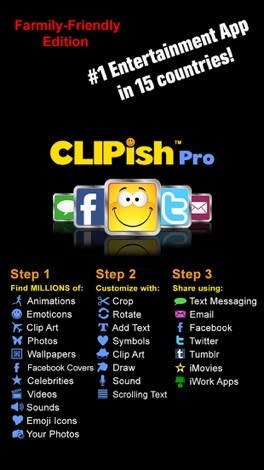 • UPDATED DATABASE of new images delivered regularly directly to your device via the CLIPish servers. * A NOTE ABOUT COMPATIBILITY WITH NON-iPHONE USERS: Emailing images works with pretty much anyone, but depending on what cell network and type of cell phone the person you're sending to has, some of the images you send via text messaging may not work. This has nothing to do with CLIPish, but is a factor of the compatibility between: 1) the iPhone, 2) your network provider, 3) the other person's network provider, and 4) the other person's cell phone. See http://clipish.net/support for more details. * FAST INTERNET CONNECTION RECOMMENDED: Due to the extensive server-side communication for downloading images, CLIPish works best for users with a strong 3G signal or WiFi connection. CLIPish is NOT recommended for users with Edge, slower connections, and/or weak signals. See http://clipish.net/support for more details. * A NOTE ABOUT ANIMATIONS ON FACEBOOK: You can send all the images and videos found in CLIPish to Facebook, including Animations, HOWEVER, Facebook converts all animations to still images. Facebook does not allow animations to "play" on their site. More by Dating DNA, Inc.